Today I'm sharing a card made with the Tulip Time collection from Heartfelt Creations. Card base: Cut a piece of cream card stock 6” x 12”, fold in half with side fold. Cut red design paper 5 7/8” square, add to card front. Using a 6” square panel, cut to 5 3/4" square and add to card front. Die cut the Diamonds & Lace die from white card stock. Cut a piece of green design paper 3 7/8” x 4 1/8”, add to back of Diamonds & Lace die piece. Die cut 2 Decorative Pocket Accents die from red design paper, adhere to back. Add to card. Using the larger diamond with the dot diamond die, cut from cream card stock. Stitch in the holes with green embroidery floss. Add to center of Diamonds & Lace die. Stamp fence on white card stock with Vintage Photo, use water brush to drag the color from the stamped lines to the inside. Die cut with coordinating die. Add to card. Stamp row of flowers on white card stock with Smokey Gray, color with Prismacolor pencils. Die cut with coordinating die. Also cut from craft foam and adhere to back of flowers. Stamp flowers on white card stock with Pearlescent Poppy, sponge with same ink. Die cut with coordinating die. Shape with 3D mold. Stamp leaves with Bamboo Leaves and sponge with same ink. Die cut with coordinating die. Add stamens to flowers and assemble flowers. Wrap the stems of stamens with green florists tape. Add flowers to card. Add lace and bow. Stamp sentiment on vellum with Jet Black and die cut with banner die. Edge with Krylon gold leafing pen. 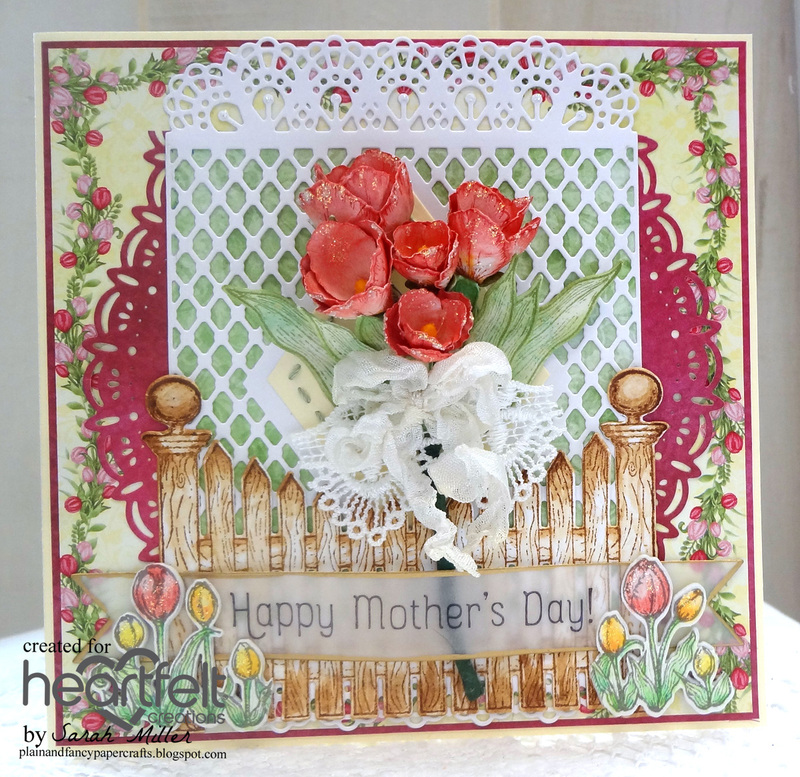 Add sentiment to card and then cut the row of flowers apart and add to card.